The iconic Trico plant is about to get a new lease on life. Sometimes, a start can seem like not much, but without a start, no project can gather momentum and without the momentum that continues to gather force in Buffalo, it’s hard to believe the $50 million redevelopment plan for the Trico building would have come together as nicely as it has. The plan for the iconic structure, actually five connected buildings, announced last week, looks like one that will satisfy the concerns of all interested parties while putting a massive structure back into productive use. That wasn’t always a certainty, as conflict arose two years ago between leaders of the Buffalo Niagara Medical Campus, who previously planned to use a portion of the building, and preservationists who were alarmed at the prospect of the likely demolition of the remainder. 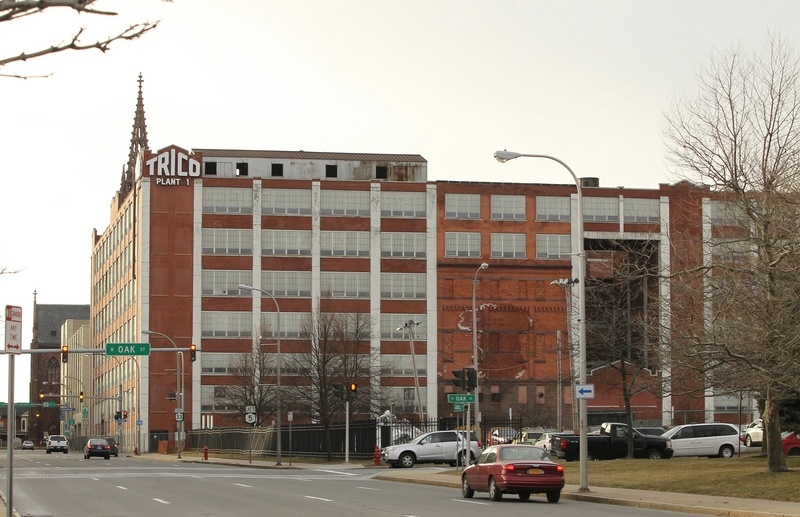 Now, though, the Medical Campus has backed away from its interest in the Trico building, leading Krog Corp. – which had been working with the Medical Campus – to deal directly with the Buffalo Brownfield Restoration Corp. Those negotiations have produced a plan to use most of the building – 500,000 of its 600,000 square feet. Krog has experience with complicated projects, which well describes any proposal to reuse the old and sprawling Trico building. Krog has partnered with Hart Hotels Inc. on a plan to convert the edifice into a boutique hotel and an extended stay hotel, with about 230 total rooms. The plan also calls for several apartments of 1,200 to 2,000 square feet, alone with commercial and retail space. An indoor parking garage is also planned. Importantly, Krog intends to respect the historic nature of one of the most significant existing structures in Buffalo. Trico led the development of the automobile windshield wiper and its success spawned the establishment of the John R. Oishei Foundation, named for the Trico founder. The plan seems to be a solid one, even given the number of hotel projects already under way or planned in Buffalo. The extended stay hotel, in particular, can serve those with family members undergoing medical care on the campus, especially at Roswell Park Cancer Institute. The apartments will help to serve those working at the ever-expanding Medical Campus or who simply want to join those moving from other areas – or from Buffalo’s own suburbs – into a rising city that is fast regaining its confidence. The Trico plan, announced last week by Mayor Byron W. Brown, is not a stand-alone project, even though it may look that way. The explosive growth of the Medical Campus helped to create a market and a desire to find an appropriate use for this building. Other developments in the city – at the waterfront, around Larkinville and elsewhere – helped to create the momentum that drives other projects forward. In that regard, the plan for the Trico building – with construction to begin this spring and be completed in two years – is of a piece with what is clearly a rebirth for this historic city. But it’s a very nice piece, indeed.